ACPC ME, M.Tech, M.Pharm Admission 2018 – ACPC has released notification for the admission to first year of Master of Engineering / Technology (M.E./M.Tech.) and Master of Pharmacy (M.Pharm.) in government, Grant-in aid and self financed institutes in Gujarat State, on state quota of all institutions and management quota surrendered seats of self financed institutes, Government of Gujarat for the academic year 2018-2019. The complete detail of ACPC ME, M.Tech, M.Pharm Admission 2018 such as application form & fee, eligibility criteria, admission process etc. are given below. Latest: Notice for Inclusion of S.J. Thakkar Pharmacy College, Rajkot as per Hon’ble Gujarat High Court has been released. Scroll down to check. Candidates seeking admission to the first year of Master of Engineering / Technology (M.E./M.Tech.) and Master of Pharmacy (M.Pharm.) in government, Grant-in-aid and self-financed institutes in Gujarat State, on state quota of all institutions and management quota surrendered seats of self-financed institutes are required to appear for Admission test 2018. The Common Entrance Test (PGCET-2018) for admission to Post Graduate Engineering and Pharmacy courses is going to be conducted at L. D. College of Engineering, Ahmedabad and/or any other centres. The CET has been scheduled for the month of July. A detailed schedule regarding the ACPC ME, M.Tech, M.Pharm Admission 2018 has been given below. Click here to check Notice for Inclusion of S.J. Thakkar Pharmacy College, Rajkot as per Hon’ble Gujarat High Court. Click here to check Advertisement regarding Admission to vacant seats due to non-allotment. Click here to check the notice for M.E./M.Pharm. programme. Click here to check the notice for confirmation of admission in Actual Round-02. Click here to check the notice for confirmation of admission in Actual Round-01. Vacant and Closure Details of Institute wise and Course wise for M.E/M.Tech and M.Pharm has been released. Candidates can check the same from below. Click here to check Vacant details for Round 3 in M.E. / M.Tech Admission. Click here to check closure details of Round 3 in M.Pharm. Click here to check Vacant details for Round 3 in M.Pharm. Admission. Click here to check the Vacant seats after cancellation schedule (including Non confirm) in M.Pharm. Click here to check the Vacant seats after cancellation schedule (including Non confirm) in M.E. Click here to check Instructions/Steps for taking part in a vacant seat in Gov/GIA/University managed Government (Unaided) and SFI Institutes. Click here to check Advertisement for vacant seats in Govt/GIA/University managed Government(Unaided) and SFI Institutes. Click here to check Guidelines for filling vacant seats in SFI at institute level. Click here to check Last date reporting at Institute has released. Click here to check the Vacant seats after Actual Round-02 (including Non confirm) in M.E. Click here to check the Vacant seats after Actual Round-02 (including Non confirm) in M.Pharm. Click here to check the Vacant Details of Round 2 in M.Pharm Admission. Click here to check the Closure Details of Round 2 in M.Pharm Admission. Click here to check the Vacant Details of Round 2 in M.E./M.Tech Admission. Click here to check the Closure Details of Round 2 in M.E./M.Tech Admission. Click here to check the Vacant seats after Actual Round-01 (including Non confirm) in M.E. Click here to check the Vacant seats after Actual Round-01 (including Non confirm) in M.Pharma. Click here to check the Vacant Details of Round 1 in M.Pharm Admission. Click here to check the Closure Details of Round 1 in M.Pharm Admission. Click here to check the Vacant Details of Round 1 in M.E./M.Tech Admission. Click here to check the Closure Details of Round 1 in M.E./M.Tech Admission. Click here to check the Vacant Details of Mock Round in M.Pharm Admission. Click here to check the Closure Details of Mock Round in M.Pharm Admission. Click here to check the Vacant Details of Mock Round in M.E./M.Tech Admission. Click here to check the Closure Details of Mock Round in M.E./M.Tech Admission. ACPC ME, M.Tech, M.Pharm Admission 2018 has released the provisional answer key after successful conduction of exam. Candidates can check their answers and get an overview of their marks. Below given are the provisional answer key for some exams. Final Answer Key of PGCET 2018 for ACPC ME, M.Tech, M.Pharm: BM, CE (Civil), CH, CO (Computer), EC, EE, EN, IC, MC, ME, M.Plan, MT, PY and TE. Provisional Answer Key on July 14, 2018: BM, CH, EC, EE, EN, MPlan, MT and PY. 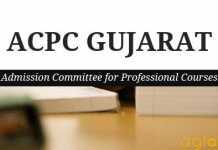 Schedule of Common Entrance Test (PGCET-2018) for Non-GATE and Non-GPAT candidates for admission to M.E./M. Tech./M.Pharm. Obtained the qualifying marks in GATE in the relevant discipline for engineering and GPAT for pharmacy. (iii) Minimum two years full time working experience in the academic, industrial or research organisation in the relevant discipline in which the candidate is seeking admission after passing the qualifying examination as on 1st July, of the year in which application for admission is made. Appeared at Common Entrance Test (CET) in the current academic year for the relevant discipline. (4) A sponsored candidate shall have minimum experience as specified in clause (iii) of sub-rule (2). All sanctioned seats including sponsored seats for the Welding Technology Course conducted jointly by the Maharaja Sayajirao University of Baroda and Larsen and Toubro Ltd, Surat, shall be granted by these institutions/ Universities on the basis of the merit order obtained in any All India Entrance Examination of repute. Institute of Infrastructure, Technology, Research and Management (IITRAM), Ahmedabad. Both GATE/GPAT qualified candidates and non GATE/GPAT candidates shall have to apply online to become eligible for admission. Before applying online, the candidate shall have to procure PIN Cover by paying a non-refundable amount in cash only from the designated branches of Kotak Mahindra Bank during banking hours (except holidays) as per the schedule. 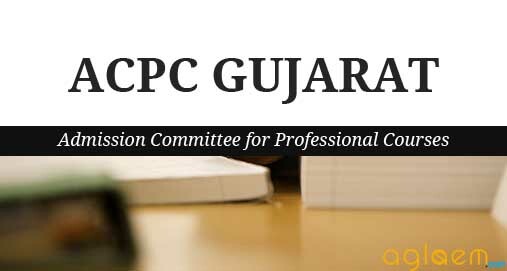 For online registration, the candidate should visit website www.gujacpcadm.nic.in between the given dates. Please note that after the due date, the candidate shall not be allowed to register online. The direct link to fill registration form will be provided below. After online registration, it is mandatory for all candidates even for those whose final semester results or result of any backlog in previous semester are awaited, shall have to submit print-out of the registration form and self-attested photocopies of the required documents at nearby Help Centre. Note: Click here to check the notification regarding Pin Cover charges. Caste certificate for a candidate belonging to Scheduled Castes (SC), Scheduled Tribes (ST) and Socially and Educationally Backward Classes (SEBC), issued by the authority empowered by the Government of Gujarat in this behalf. Certificate of Physical Disability, issued and duly signed by the Civil Surgeon/competent authority, in case of a Physically Handicapped candidate. A copy of certificate of In-Serviceman duly issued by the Commanding Officer of the respective unit in which he is serving. Sponsorship letter issued by the authority sponsoring, in case of sponsored candidate. In case of sponsored candidate, experience certificate along with Form 16 under IT Act, 1961, from the employer for last 2 years. Such other certificates as the Admission Committee deem necessary. Note : The candidate shall attach only those copies which are necessary to be attached with the application form. Syllabus of PGCET for various different Courses is mentioned below. The first merit list shall include the candidates who are eligible for admission under sub-rules (1) and (2) of eligibility criteria the merit list shall be prepared on the basis of marks/score obtained by such candidates in GATE/GPAT. The second merit list shall include the candidates who are eligible for admission under sub-rule (3) of eligibility criteria and merit list shall be prepared on the basis of marks obtained by such candidates in Common Entrance test (CET). The Merit list of the candidates belonging to reserved categories shall be prepared separately. Percentage of marks obtained at qualifying examination. Date of Birth (candidate who is older in age shall be given priority). placed at an appropriate order in the merit list. ACPC will conduct counselling for the admission to first year of Master of Engineering / Technology (M.E./M.Tech.) and Master of Pharmacy (M.Pharm.) for the academic year 2018-19. The candidate shall have passed B.E./B.Tech. or equivalent examination with minimum 50% (45% for SC/ST/SEBC candidates) at qualifying exam for M.E. / M. Tech courses or B. Pharm with minimum 55% (50% for SC/ST/SEBC candidates) at qualifying exam for M.Pharm courses for seeking admission into post Graduate disciplines and its specialisations. The Admission Committee shall publish the schedule of online counseling program on its website. The candidate shall be required to indicate his discipline wise order of choices of courses and colleges or institutions, online. Allotment of seats shall be made on the basis of merit, category of the candidate and availability of seats. The allotment of seats shall be published on the web-site of the Admission Committee. The candidates are required to obtain the print out of the Information letter and bank fee receipt copies from the website. (b) if seats remain vacant, to those candidates whose names appear in the second merit list. On payment of tuition fees as required, either online payment or in the branches of banks as specified, the admission allotted to the candidate shall get confirmed. The candidate shall be required to log in to his account to get the print out of the Admissions Slip. In case, the candidate fails to pay the tuition fees within the prescribed time limit as aforesaid, the admission offered to him shall be treated as cancelled. Such candidate shall not be eligible to get admission on the same course in the same institute in the successive rounds of counseling. Where the considerable number of seats falls vacant and it appears to the Committee to fill the vacant seats, it may conduct the online admission process for upgradation/ reshuffling of seats. The candidate, who opts to partake in such process by giving online consent, shall be considered for such rounds and the candidate may be upgraded in the choices given. If the candidate gets the admission on the basis of up-gradation, then, his admission granted earlier shall be treated as cancelled. For more details on ACPC ME, M.Tech, M.Pharm Admission – Download Information Brochure 2018.